In the mid 1950's, banks often still had real silver dollars. You could walk in and just trade paper dollars for real silver coins. I did that as often as I could afford to, which wasn't all that often - a dollar wasn't easy for a pre-teen kid to acquire and was roughly equivalent to $10.00 today. I did get as many as I could afford, going back to trade in the duplicate dates. I got a few more as Xmas and birthday gifts; silver dollars were a common gift from grandparents, exhibiting a bit more thought than a dollar bill and more interesting because of their age, yet easily obtained from almost any bank. Early on I found or was given a nice 1878 Morgan with the moderately rarer 7 over 8 tail feather reverse. This oddity was caused by a design change part way through the year; a simple matter of correcting the feathers of the Eagle's tail to match the reality of nature. To save a little time and money, the original 8 tail feather design was simply re-engraved with the correct number of feathers so that minting could continue while new dies were prepared. Although I sold off all my other silver dollars (especially as they became more valuable), I hung on to that 1878 for years. 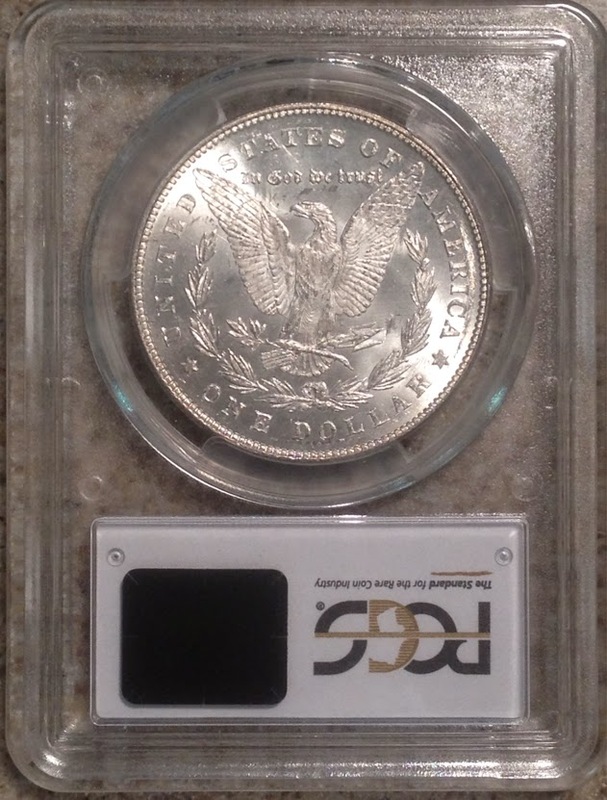 I finally did sell it at a coin show in Brockton, MA to a collector who specialized in Morgan silver dollar die varieties. He told me that he had never seen this specific variety before and really wanted it. We negotiated a fair price, though if he really was expert at these varieties and had never seen this before, it was probably worth more. However, I felt it was going to a true collector and did not mind if I had left a little profit on the table. I had only paid a dollar for it anyway and he did not have to be honest about his suspicions, so I was happy. I do wish I had thought to get his name to find out if it truly was a then unknown specimen. See 1878 Silver Dollars for more on that. The coin pictured here is an 7 tail feather example, which means it was made later in the year and from new dies. However, because of a slight difference in the feathers of the arrows (the fletch), I also know that it did not come from the very last dies manufactured that year. This is the sort of trivial detail that is part of numismatics (the study of coins). Of all the 1878 varieties, that one is the easiest to find, except for the 1878-S (San Francisco Mint). In the early 1980's, I had a very unusual experience involving silver dollars. I and another coin person were hired by a large New Jersey silver refiner to look through some bags of silver dollars that they were about to melt for their silver value. Our job was to extract any coins that could be sold for more than the value of the silver. I don't remember how long we were there, although I think it was two or three days. I don't remember how many coins there were, though I do remember that when I first looked at the pile we were to examine, it was quite impressive. Of course just getting to that point had involved passing through metal detectors and descending several stories into the underground vaults. We did find some rare dates and, if I remember correctly, one or two counterfeits. The one I remember most clearly was a fairly nice Seated Liberty example. Most of the coins were Morgan or Peace Dollars. I can tell you that after flipping thousands of coins, I started hallucinating rare dates and had to blink and recheck quite often. Probably many Americans today have never seen a Morgan or Peace dollar, never mind one of the earlier dates. I think the Morgan Dollar is one of the more attractive U.S. coins ever minted - it is a shame that so many went to melt in the furnaces of refiners. I consider myself lucky to have lived at a time when these were common.